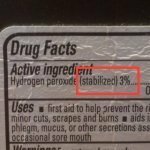 Using hydrogen peroxide for cleaning is practical, non-toxic and cheap! It kills bacteria, viruses, and mold, and can be used for lots of tough household jobs. Even though I’ve been using hydrogen peroxide for years, I’m still finding more uses and learning more uses. Just put some 3% hydrogen peroxide into a spray bottle. Spray it on and wipe it off as you would with other household cleaners. Another great option is to use sodium percarbonate mixed in hot water. Another option is to use a half gallon of very hot water, and add a half gallon of 3% hydrogen peroxide. This will result in a solution that is 1.5% hydrogen peroxide, and, obviously, mixing it this way will cool the mixture down quite a bit. 1.5% is also fine for washing floors. You can add some plain soap to the solution if you wish. Finally, if you don’t mind using cold water to clean the floor, you can just spray some 3% hydrogen peroxide onto the floor from your spray bottle. That's what I usually do. This also works well for day-to-day cleaning up gunk on the floor, and disinfects as you go along. Splash 3% hydrogen peroxide around the toilet rim and onto your toilet brush, then scrub the toilet as usual. Also use 3% hydrogen peroxide on a sponge to clean the rest of the toilet surfaces, and the floor around the toilet. If the toilet is stained, adding a small amount (maybe a cup?) of 35% hydrogen peroxide to the toilet bowl, and leaving it overnight will help a lot. This only works on the area that is under the water, however, not stains above the water level. For heavy duty stains, you may need to repeat this treatment. Hydrogen peroxide won't remove hard water marks (but vinegar will). Spray 3% hydrogen peroxide onto the walls of the shower and let it sit for a while. For tiles that have mold or mildew, this will start to loosen it up and clean it out. Depending on the amount of mold and mildew, you may need to leave the solution on longer, or repeat this treatment. Certainly using hydrogen peroxide, over time, will reduce or prevent mildew and mold from developing. First off, it is anti-bacterial, anti-fungal, anti-mold and anti-mildew. Whew! Fourth, bought in concentrated form and in bulk, using hydrogen peroxide for cleaning is very inexpensive.